A driver unfamiliar with the area was following her GPS when she became stuck on tracks in East Kingston, New Hampshire. She exited her vehicle a short time before a commuter rail train slammed into her pickup truck. 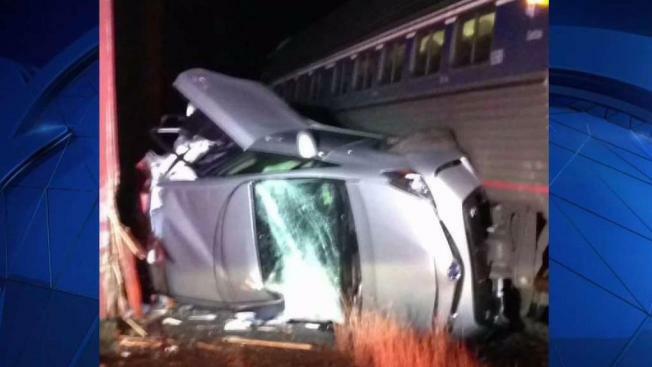 A pickup truck driver wasn't injured after being involved in a crash with a train in New Hampshire on Saturday. Authorities say it happened around 5 p.m. in East Kingston on Depot Road, along Route 107, near the town's fire department. According to East Kingston police, the driver was unfamiliar with the area and following a GPS to route 108 when she turned prematurely and became stuck on the westbound train tracks. A neighbor alerted the woman to exit her vehicle shortly before a commuter train slammed into the vehicle, pinning it against the Old Train Depot station. Although authorities had previously said the driver had suffered minor injuries, they later clarified the driver wasn't injured. A photo of the scene shows massive damage to the pick up truck, which appeared to have parts of it crushed underneath the wheels of the train. East Kingston police later confirmed that the vehicle was totaled. There was no damage to the train.